Yesterday afternoon I posted about the release of the latest build of Chrome OS. This new build started rolling out to all devices yesterday and has a lot of great features and improvements in it. The reality for me however is that I have been using the 48-build series for a couple of weeks now as part of the Chrome OS beta program. Like any other beta program, this one allows me to download a beta version of the OS to my Chromebook and see new features as well as help the Chromium team with bugs. It’s a bit of a win-win. The good news is, as far as Google and the Chromium team are concerned, anyone can join the beta program. With a simple change on your Chromebook or Chromebase, you can move from the normal Stable channel to the Beta channel so you too can get these beta builds before they hit the Stable channel. 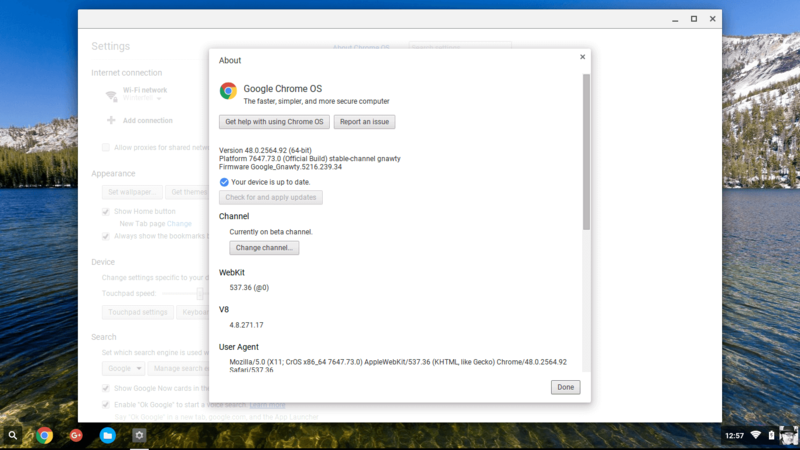 In this How To I’ll show you how to set your Chrome OS device to the Beta channel and the process for reverting back to the Stable channel. Before I do however, a word of warning. They call the channel Beta for a reason folks. You are very likely to run into bugs or other weirdness if you move to this channel. The goal of the channel is not to give you access to new features first but for you to provide feedback to the Chromium team on bugs or issues that you run into while using the release. Beta programs only work when those using the software actually report bugs. So if you are willing to do so and willing to live with a bug or two, sign up. If however you can’t make the time commitment to report bugs or your Chromebook is mission critical, don’t get in on the Beta channel. Okay, onward to the How To. exposed in the box. You will see a Change Channel button and now click that button. This will bring up three options for you. Stable: This is the production channel and the build of Chrome OS. It is the most stable and the one the vast majority of readers will want to stay on. Beta: This is the precursor to the Stable channel. This channel sees reasonably stable builds with new features before they get to the Stable channel. The vetting of bugs is highly dependent up members of the beta channel. Developer: Consider this Alpha. These are very early builds and often contain many, many bugs. The point is for those who are Chrome OS developers, they have an early preview of any big changes coming in the platform so they can start preparing their apps now. This is truly only for developers. To move to the Beta channel, click the radio button to Beta and click OK. If there is a new Beta build available, it will immediately be downloaded to your Chromebook and after a reboot, you are in the channel. So let’s say you get into the Beta channel and you find that you don’t have time to report bugs or it is simply too unstable for you to use effectively. You can move back to the Stable channel with no problem but, and it’s a big but, it requires that you do a Power Wash of your Chromebook. The good news is that the whole process is automated for you. To go back to Stable channel, just follow the instructions again and make your way to the Change Channel button under Settings>About Chrome OS>More Info…>Change Channel. Select Stable and click OK. You will be warned that if you change to the Stable channel that your system will be Power Washed. Make sure any local files you have not backed up to Google Drive are backed up before you proceed or you will lose them. When you are ready click OK and the Stable build will be downloaded to your Chromebook, it will be installed and your system will reboot and be Power Washed. Once it is done, you will be prompted to setup your Chromebook as if it were new out-of-the-box. For more tips and How To’s, be sure to check out the How To Pages.